With the number of races that we’re adding on our global series, you could argue that it’s outstripping the magnitude of a quality professional athlete pool. And so one of the things we’re having a serious look at is whether we should have fewer races that have points [..] and have those [..] points be higher. While Andrew made these statements in the context of 70.3s, this is a pretty clear indication that the number of races that offer KPR points will go down – in other words that there will be Ironman races that do not offer any KPR points. 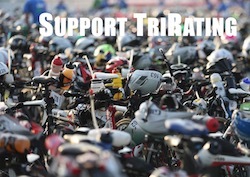 The first of these races is going to be Ironman Maryland – the old Chesapeakeman rescued by WTC. This is a race that never had a Pro division, so it’s relatively easy to use this as a trial for a non-Pro Ironman. However, I believe that we will also see a number of existing Ironman races that will not offer a Pro race (or at least one that is relevant for Kona qualifying). One of the main criticisms of the KPR system is that athletes have to race well in at least two Ironman races (and possibly more) in order to qualify for Kona. Therefore, I think that ultimately a reduction in the number of qualifying races should create a situation where one really good race (winning, maybe even a podium) is sufficient to qualify for Kona. I’m even thinking about a scenario that only about 10 races will have points that qualify for Kona. A possible breakdown could be Kona, three Regional Championships (currently Melbourne, Frankfurt and Mont Tremblant) and five other races across all continents (North America, South America, Europe, Africa, Asia/Pacific). Even sticking to the current points system levels of P-8000, P-4000 and P-2000, this reduced number of races practically guarantees that a podium spot even in the five continental races would probably be good enough to qualify for Kona. Of course, this is not a complete discussion of the issue of reducing the number of races, and I’ll go into further details and consequences in my next posts. My assessment: Changes likely, possibly reducing the number of KPR races as far down as to about ten. Maybe 70.3 qualifying will be used as a trial for a modified system. KPR Thoughts (3) – Why have a Points-based system?